Tauck, which introduced two new river ships in Europe this year, will add three more vessels by 2016. The company in April will introduce the Esprit, the fifth vessel in the 118-guest Jewel Class, and two more 130-passenger Inspiration Class ships in 2016. The new Esprit will operate on the Rhine, Main and Danube rivers, offering 14-night cruises between Amsterdam and Budapest, and seven- and 12-night voyages between Basel and Amsterdam. Tauck’s river cruise expansion plans were disclosed by CEO Dan Mahar during a meeting with the media held onboard the new Savor, which was christened June 21 in Bingen, Germany. Tauck first chartered a riverboat in 1991 and built the first ship to its own specifications, the Swiss Emerald, in 2006. The Savor is the second in the new Inspiration Class of ships, introduced by the Inspire, which entered service in April. The new vessels, built in partnership with Scylla AG, a Basel, Switzerland-based ship builder and operator, will help Tauck meet the fast-growing demand for river cruises. Tauck met the challenge on the Inspiration Class by designing the innovative Loft Staterooms, which add a high ceiling with a huge window that actually opens. The platform and window are raised above the water line, while the bulk of the cabin and bathroom are below water. Five steps lead up to the platform, which has a table and two chairs and a view from just a foot or two above the water line. The middle part of the huge window opens with a push of a button, as do the window’s drapes and sheer shade. 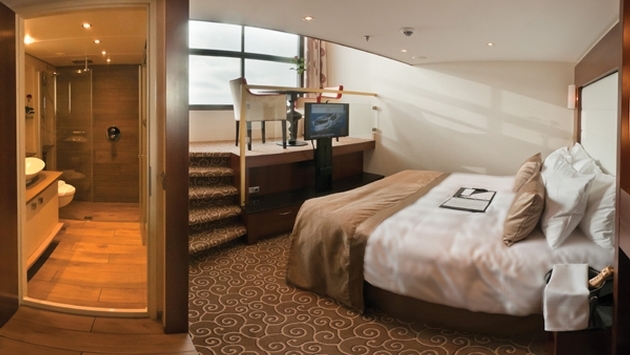 The result is an airy 225-square-foot stateroom flooded with natural light. The cabins above on the second level also measure 225 square feet but are configured in an L-shape to accommodate the raised ceilings in the Loft Staterooms below. The section of the upper-level rooms is like a foyer and doesn’t feel like space was taken away to make room for the loft one deck below. Mahar said he expects the river cruise segment to continue growing. “Demand still exceeds our supply,” he said.